I’ll be the first to admit, I am terrible at making good looking & functional UI. Functional yes, but not functional & good looking. 🙂 So I will keep it simplistic, minimal and hope that the ease of function will work for most players. Note, the green text is a place-holder, still looking for a nice font. Upon landing on a planet, you proceed directly to the Mercenary & Merchants Guild HQ at that location. It’s often a more seedy spot, where anything goes. Here, you can access the trade menu to sell/buy goods, hangar menus to buy/sell/store modules as well as ships. 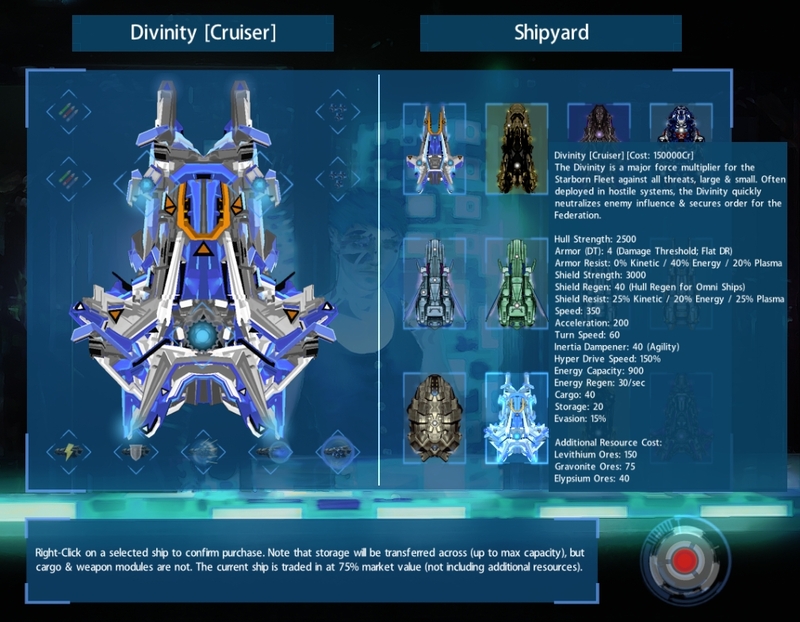 For Modules, each ship share 5 main categories for upgrades: Energy, Armor, Shields, Engines & an Active Slot.Each slot, there’s many options, but players have to pick & choose. There’s definitely trade-offs with module choices. The weapon slot & size depends on the ship itself. If the ship has secondary weapons, such as launchers or drone bays, it’ll be displayed. I’ve made the launcher/drone bays universal, of different sizes, from S to L-Class. Missiles, Torpedos & Drones have sizes accordingly. The idea is a S-Class bay can hold X/Y/Z of S/M/L-size armaments. This means smaller ships with S-Launchers can still pack a bunch of high-powered Torpedos or they can pack a lot more smaller S-size missiles. 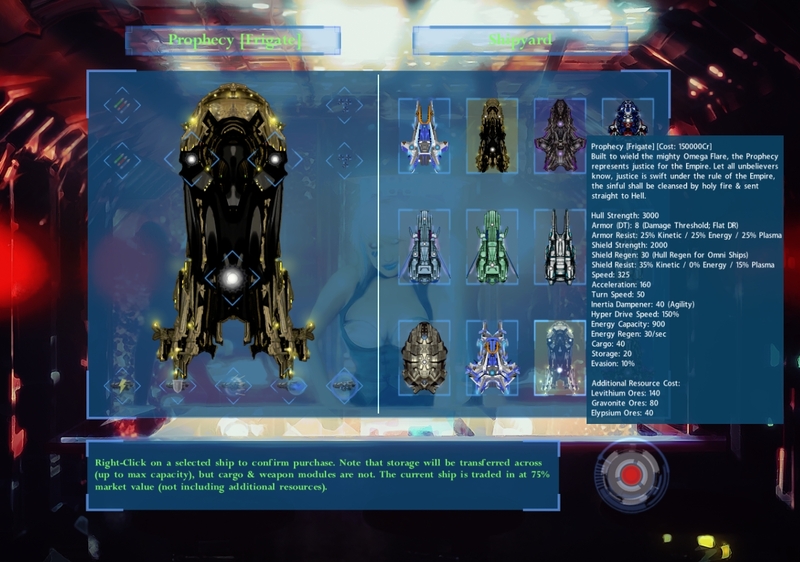 Its flexible to allow players to pick & choose what best suits their playstyle. There’s also storage (separate from cargo-hold for tradegoods!) for modules on your ship, with larger ships having a larger capacity storage. 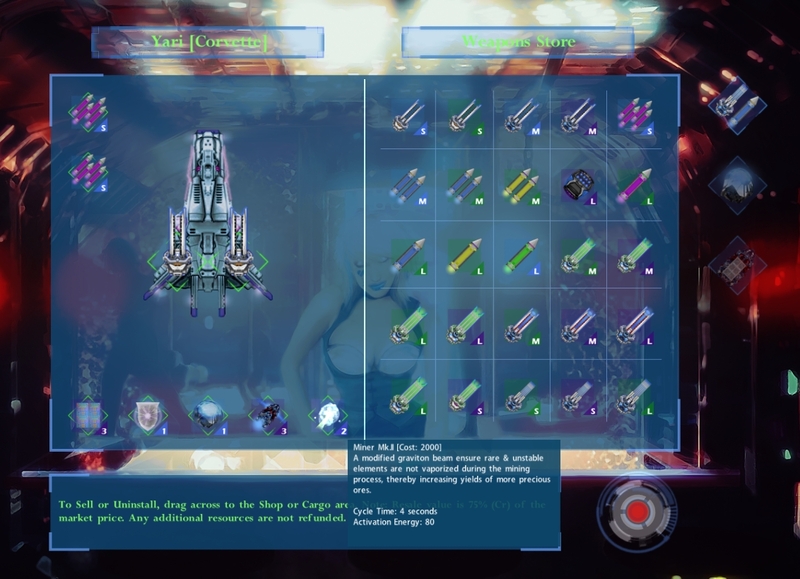 It’s useful not only for storing loot from battles, but also extra-modules in case the situation changes and you need to re-configure your ship. For ships, there’s a wide range, with each ship focused for a particular niche (gunship, strike (fast/evasive), missileer, drone carrier or mixed jack-of-all-roles) within its class, of which at launch there will be three classes: Corvettes, Frigates, Cruisers. Corvettes are very fast, agile & evasive. They have an innate 50% evasion against weapons of M-Class or above, this means Frigates & Cruisers have trouble 1) tracking such a fast agile target and 2) even when they fire, it may simply miss completely. The goal is to make Corvettes good as entry noob-ships, but also the later Faction Corvettes or advanced prototypes can be used as an end-game ship by players who love the fast & furious gameplay (ie. with good flying, Corvettes can dodge ALL enemy missiles!). Frigates sacrifice some speed & evasion for a lot of firepower, as they can equip multiple M-Class Turrets as well as often packing bigger Launcher & Drone bays. They still have an innate 25% evasion bonus against larger turrets, so its a good trade-off vessel. Cruisers lack speed and have no evasion, but have higher armor that defeats smaller weapons, and more weapons options, as well as access to L-Class Turrets which have by far the most firepower. Rest assured that all three classes are viable end-game, as it will depend on your skill selection for your pilot, as well as talent selection for your squad NPCs. ie. If you don’t want to be a tank Cruiser, spec your NPC to tank. 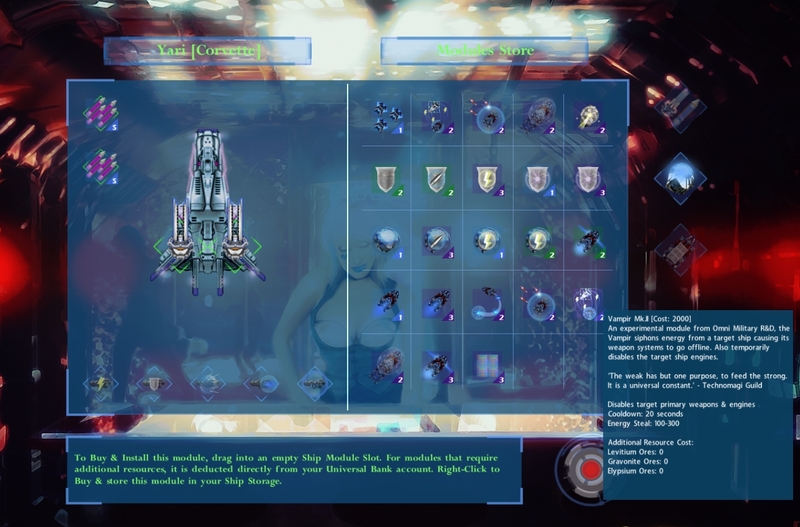 ← Star Nomad II: Introducing the Starborn Federation!